Capt. Alex Aslou of M/Y Bacchus won the prestigious Charter Captain of the Year award at the annual event held at the Monaco Yacht Club. Capt. Ferdinando Tarquini and the crew of M/Y Force Blue were named the Best Charter Crew among the fleet’s yachts over 50m, and Capt. Mattia Dzaja and the crew of S/Y Ohana were named the Best Charter Crew on yachts under 50m. The 18th edition of the Captains’ Dinner hosted more than 400 guests at one of the show’s biggest events. In addition to the award, Capt. Aslou was awarded an electric foldable UJET scooter, a Porsche driving experience, a Garmin sportswatch from Pantaenius, two weeks free berthing from Port Adriano, a gift from Sagreati, and a magnum of Mirabeau Classic rosé. The Best Charter Crews both received a training voucher or a Big Boys Toys Experience day from Zephyr Yachting, a hamper of beauty products from Frangipani for each crew member, a set of backpacks from GMT for the whole crew, two weeks free berthing from Port Adriano, and a magnum of Mirabeau Classic rosé. 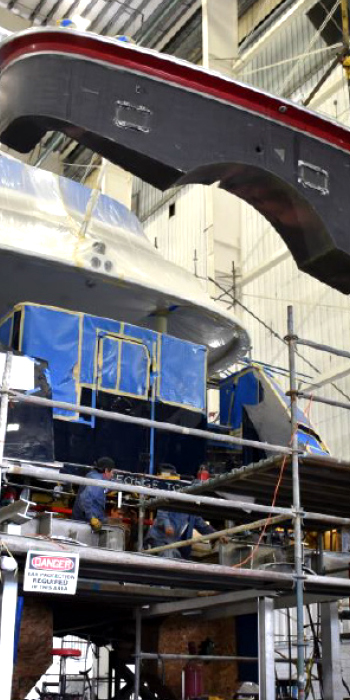 Bacchus is very proud to have completed an extensive refit in 2016 at Thunderbolt Marine outside Savannah, Georgia. Most notably, the swim platform was extended by 4 ft and collapsible stairs were fabricated with sturdy stainless handrails, leading into the water and maximizing the fun allowing for easy entry and retreat from the ocean. With a new official length of 146' Motoryacht Bacchus is actively chartering and offers even more features for guests seeking the perfect luxury yacht charter vacation. Motoryacht Bacchus is named after the Roman God of Wine, aptly illustrated in the yacht’s logo with the symbol of grape leaves and twirling vines. Dining experiences aboard Bacchus are extraordinary and our extensive wine collection is truly impressive. The skylounge bar complete with a fabulous back-lit onyx top is perfect for cocktails and aperitifs. Our flatware, crystal and china are evocative of luxury and style. With sterling silverware by Reed & Barton, casual china by Villeroy & Boch, formal china by Lenox and cut-crystal glassware by Heritage, the atmosphere of class and sophistication makes each meal an unforgettable occasion, while the ample space onboard 142' Motoryacht Bacchus means that we are well equipped with all that’s needed to dine in absolute style. Ever wonder what the right glass is for your favorite drink? Read on and find out some of the most popular ones we carry onboard Bacchus. Cheers! St. Barths is a favorite Caribbean destination on Motoryacht Bacchus. Captain Alex of Motoryacht Bacchus (142' Trinity) has cruised worldwide over the years, but when it comes to luxury yacht charters in the Caribbean region, St. Barths remains one of his preferred spots. St. Barths (officially known as Saint Barthélemy) is a beautiful island that speaks of class and finesse. Whether guests enjoy going out for an afternoon of people-watching, prefer the peace of the mountains, the privacy of a solitary anchorage or designer shopping, St. Barths caters to everyone. With an exclusive atmosphere that attracts the rich and famous, its natural beauty and white-sand beaches beckon all of us. The diverse cultural heritage of St. Barths translates into a myriad culinary options, there are fabulous choices for French, American and Caribbean cuisine. St. Barths is eclectic and high-end, at times making you forget you are in a Caribbean island and transporting you to a classic corner of France. St. Barths is coveniently located about 35 kilometres (22 mi) southeast of St. Martin and north of St. Kitts. Puerto Rico is 240 kilometres (150 mi) to the west, making it a very easy destination for charter guests coming from all over the world. There are 22 public beaches in St. Barths, most are called “Anse de...” (Beach of), and 15 of these are appropriate for swimming. Generally speaking, the beaches on the leeward side offer calmer waters as they are protected by the island’s natural geography, hills and reefs. The beaches on the windward side are favored by windsurfers. Superior personalized service, fabulous crew and a perfect megayacht. On a recent interview Captain Alex and Chief Stewardess Stephanie of Motoryacht Bacchus answered a few questions that provide a unique glimpse into the luxurious vibe of this 142' Trinity charter yacht. What makes the Bacchus crew so special? Our crew is unique in that we are a fun and very creative group. We strive to please our charter guests by understanding them from the moment they send in their Preference Sheets, all the way through our first meeting onboard, and every day of their charter vacation. We like to personalize the charter experience for each party and we believe that all details count. Our chief stewardess who is well-versed in the art of flower arranging, just ordered the guests’ favorite flowers and made her own arrangements to welcome them. On another recent charter we had guests with two young kids and we organized a teddy bear picnic on the beach, a pirate scavenger hunt and a princess-fairy-themed-room which were all a joy for the little ones. We love seeing guests have an absolutely wonderful time on charter, and we truly enjoy going above and beyond all expectations preparing everything so that their holiday is excellent. Traveling around the world and meeting new people are some of the biggest treats of being crew on a luxury charter yacht. Exploring new destinations also helps us become knowledgeable about great places to visit and things to do, all of which we love to pass on to our guests. We have learned that charter guests truly value the expertise of the crew. What makes 142' Motoryacht Bacchus a perfect choice? Our shoal draft (6' 9") allows us to get closer to some unique destinations. Our layout is extremely convenient so we can accommodate 12 guests in total comfort. Our recent updates are awesome, Bacchus is very luxurious but also very functional, so our guests can have every experience and ambiance, whether their mood calls for the formal or the casual, and it is all very quick to set up and arrange. Our crew is amazing. We have solid service and hospitality backgrounds and as a group we really go the extra mile to make our guests’ charter vacation unforgettable. We work well together and look after each other, great teamwork also translates into a better experience for our guests. Welcome to 142' Trinity Motoryacht Bacchus, where your dream luxury charter vacation become a reality in the destination of your choice. 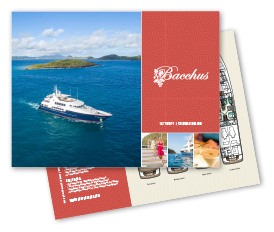 Bacchus has been designed for the ultimate charter vacation. Beautifully refit and luxuriously appointed, this 142-foot yacht is fully equipped to inspire the vacation of a lifetime. Join us onboard Bacchus and you will discover a world of romance, adventure, celebration and relaxation. Named for the God of Wine, Bacchus embraces her guests in sumptuous surroundings where every whim is catered to by her attentive and professional crew. Visit our blog frequently and we will keep you updated on the hottest cruising destinations from the tropical islands of the Caribbean to the quaint villages of New England and beyond. We will also share gourmet recipes from our culinary trained chef, specialty cocktail ideas by our Chief Stewardess and interesting details that will entice and help plan your next yacht charter holiday.